Beyond the Frontline is a regular feature where the staff here get up on the soapbox and put forward an idea or idea relating to Halo. Each BTF is a talking point designed to start a dialogue and unlike our regular word blasts and articles, the entries are short and sweet. Someone suggested having the Halo Bulletins readable on the Xbox Waypoint app and it got me thinking about how Waypoint isn’t what I want it to be. I love Waypoint’s content and features. It’s awesome and slick especially since it’s essentially a premium product that we get for free. I’m happy that Waypoint exists and I hope to see it stick around for a very long time. I hate what it is. I hate the fact that Waypoint is a seperate app on the Xbox. 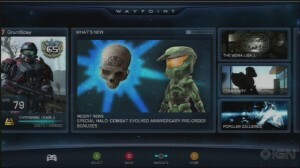 Why does Waypoint need to be separated so entirely from the Halo games? Why can’t we access Waypoint, including the new expanded content coming soon, from within the game itself? The downside of using Waypoint is that you need to disconnect from playing Halo in order to tap into Halo Waypoint – which is supposed to link you into the Halo games. But it doesn’t. It forces you to disconnect from Halo if you want to use it. Waypoint has a nice suite of unique achievements and social items but the simple fact that you have to use Waypoint in the least social way possible to access it mostly defeats the purpose. Playing Halo with your buddies and want to check out Waypoint? Tough. You need to leave your friends behind and stop playing the game. Not every Halo player will use or even see Waypoint in any form simply because it is so disconnected from the games. Most Halo fans don’t even know it exists. The average player buys the game and boots it up the Xbox and just plays. Maybe the player will stumble across the Waypoint shortcut buried in Reach’s Start menu, but considering the warning that you have to leave your gameplay session to investigate further surely stops a numbers of people. Imagine playing some Halo with your party. You play some Customs and then some Matchmaking. You start smack talking and decide to compare some stats and it’s all there in the game as you don’t have to leave. Maybe you’ll create a weekly challenge there and then and challenge everyone in your current party. Maybe you’re on your own and your buddies aren’t online so you select one of the recent Sparkast episodes to stream over the headset instead of listening to a bunch of teenagers insult you from the opposite (and occasionally your own) team. Maybe after playing some games you want a break so you take your party over to Theatre 3.0 and watch some old Halo 3 Vidocs or Red vrs Blue. You start up matchmaking again and choose to keep on watching the videos with your buddies until voting starts – you might even tolerate long waiting times between games. I want to be able to check out the best Halo content from the community filtered by the Halo team on Waypoint but I want to enjoy that content from with Halo itself. I have to force myself to remember to use it. Like many players I have my pc right beside me next to my television so there is little reason to visit the separate Waypoint app on the Xbox when I have the majority of the content at my fingertips already on the website. The next update for Waypoint doesn't go far enough! If Waypoint was built directly into the game, then it would make much more sense to access the content from the game itself and a significant portion of which would benefit from that kind of ease of access – especially for those without a PC handy. There’s a disconnect between the Waypoint app and the Waypoint web site. And a further barrier again between both of them and the actual Halo games. I hope they’re working on integrating Waypoint as a service within the game for future Halo titles. It’s definitely where Waypoint should be headed. Do you agree or disagree with us? Tell us what you think below in the comments. Feel free to check out other BTF entries here.